The driver, whose name has not been made public, told the officer that “He’s my best friend,” when he was asked who his passenger was. The officer was amused and couldn’t help but take a picture of the decoy, but he wasn’t amused enough to let the driver away without a ticket. This is likely one of the best attempts to outsmart police in HOV lanes to hit the internet, but it is actually fairly common. 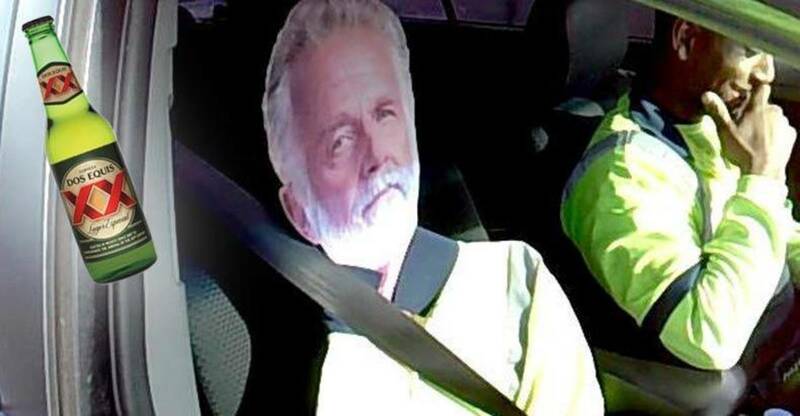 Twitter is filled with photos of fake passengers that drivers constructed to fool police. Luckily, this guy was stopped by a cop who had at least a small semblance of a sense of humor, and aside from the ticket, there was no actual harm done to the driver. However, if he was stopped by the wrong cop on the wrong day he could have ended up dead. Still, it seems that this could become another arbitrary reason for police to pull people over and harass them. Spotting a cardboard cutout or mannequin traveling at high speeds is extremely difficult, and if cops are able to pull people over for having fake passengers with some regularity, that means that they are also bound to make mistakes and pull over innocent people under the pretense that they are cheating HOV lanes.